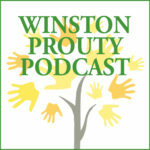 Winston Prouty is celebrating it’s 50th year in 2019! 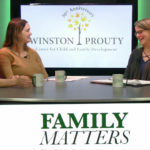 Throughout this anniversary year, we want to share stories of people whose lives have been impacted by the Prouty Center as we celebrate and think about the next 50 years. There are strong cultural images about motherhood, the “glow” of pregnancy, the joys of breastfeeding, how we forget the pain of giving birth. 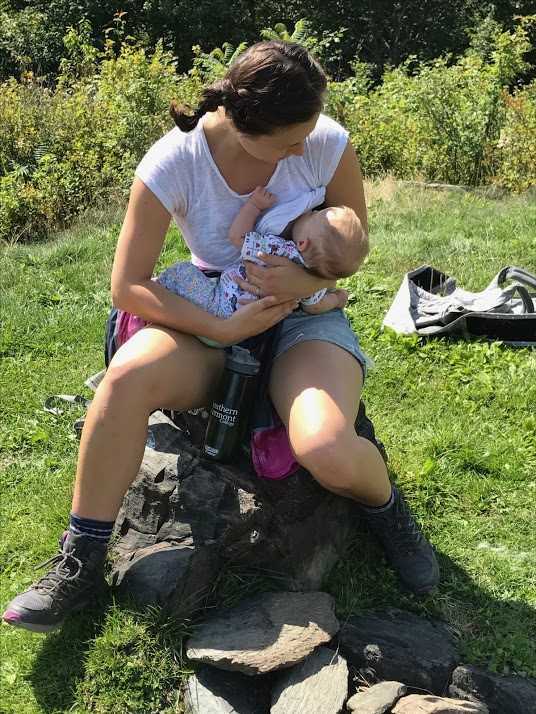 When the reality of individual experience does not match these images parents can feel stress and anxiety about whether things are going “right.” Breastfeeding is an area that can be particularly tricky for many reasons. 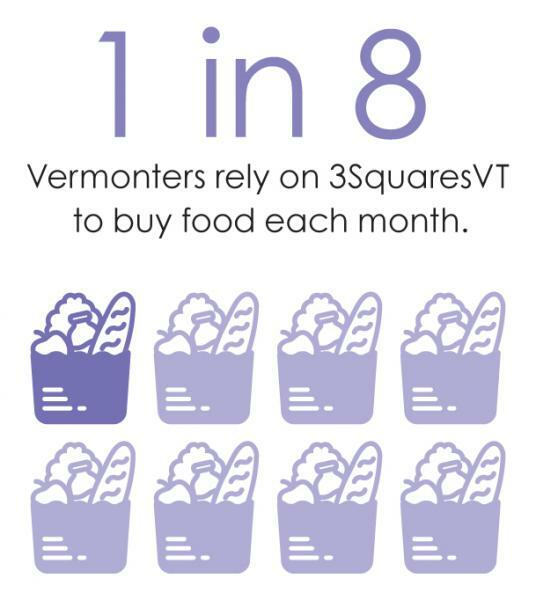 It is about food and a baby getting the calories and nutrients needed to thrive, one of our most basic parental duties. 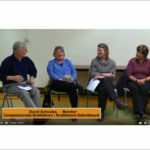 The bulk of the responsibility for it rests with one parent, and it can be hard for others to know how to help. Alfred Hughes Jr, who has been a teacher at Winston Prouty for 17 years, is our new Outdoor & Afternoon Program Coordinator. Alfred will be spending time with all six classrooms, leading nature-based activities on campus. 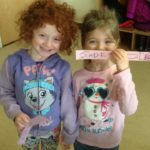 Recently, the children have been finding animal tracks and scats, saluting the sun, and listening to “Nature’s Lullaby” – running water, airplanes, dogs parking, cars, etc. Not only is this appropriate for the month of Love (February), but it describes the work we do in our infant room. As we embrace the RIE philosophy into our room, it is so important to be very mindful and purposeful with our words and actions to provide care and education in a loving respectful way. Using care with our words and soft voices. When we pick the children up, we do it slowly, we keep our hands soft, yet reassuring. 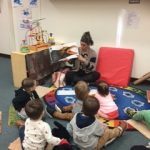 Our body language and facial expressions speak volumes to these infants. They are drinking up all we say, all we convey, all we share in our time together. It’s so easy to go into your own thoughts and think about your worries, grocery list and such; it is much more challenging yet powerful to be there in the moment with an infant sharing the time, reflecting their emotions and supporting them, and reassuring that they are safe and loved. 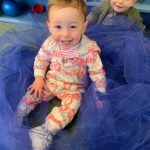 We have been so very busy getting to know our new infant group. Their likes, dislikes, how they like to be held, what cry means what message. 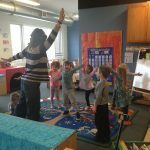 We are watching them find their fingers, and toes and each other, which is a huge delight when they greet and reach towards one another each day. This past month has felt a bit chaotic welcoming 6 new infants, and helping them adjust to us and the environment. We take comfort in knowing that we are laying the foundation of trust, relationship, bond, and love through all our actions, perhaps just by holding them with our mind and heart. The new Willow Room is designed to continue the RIE (Resources for Infant Educarers) method that was introduced in the Acorn (Infant) Room. 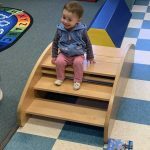 Children are physically progressing to pulling-up, standing-up, walking, climbing, and learning to go up and down steps; well as cognitively and emotionally moving from sensory to symbolic play individually and with friends. 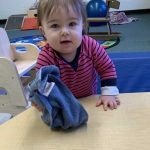 Children in Willow are also learning new routines, such as using utensils, drinking from an open cup, and sleeping on a mat rather than in a crib! 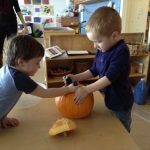 Caring and respect for the individual child’s uniqueness is the cornerstone of daily practice and all of this learning happens through exploration, engagement, and discovery. 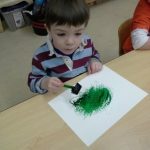 The month of January we explored the color “blue” with many activities. 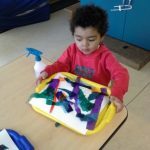 We enjoyed making “snow scenes” with white paint on blue paper and adding some glitter as well as some color blending too. They all enjoyed the dramatic play with a grocery store and play foods as well as cars at our transportation table. 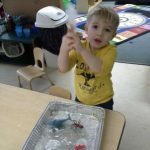 There was some brutally cold days outside so instead we stayed in and did some sensory play with bubbles and water. 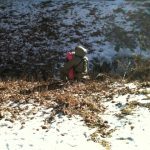 On the days we were able to go out, we walked over to the snow mountain. For the the month of February we will be doing the color “pink” for Valentines Day! We will do some baking and art. We will have our “Prouty Tool Shop” and introduce the light table as well. We hope to introduce our “Hickory’s Dickory Dock” storyboard and learning to count to 12. We also will be welcoming new friend Madeline to our room! 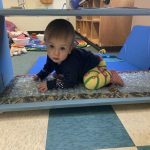 Sensory table with water and bubbles! We love our snow mountain even if there wasn’t enough snow on it to play! January has been a busy month in the new Maple Room, and we are enjoying our new space. Shelves were filled very quickly and toys and materials found a resting place. We are enjoying our bigger bathroom and wider hallway, which makes moving about so much easier. We welcomed the official start of winter and the winter weather. It seems like the weather cannot make up its mind lately, with over a foot of snow, arctic temps, flooding rain and spring like weather (all in 24 hours). 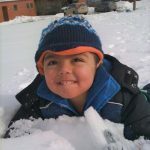 The children are learning to enjoy the deeper snow. 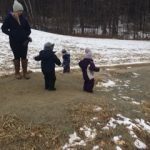 They are getting used to snow in their boots and mittens, and are having lots of fun sledding and rolling in the snow. Maples have been growing, and we now have 7 three-year-olds. You can see all of their “bodies” in the hallway, decorated with tempera paint sticks, they are colorful and fun to look at! 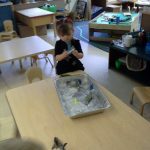 We have painted with frozen watercolors, explored ice with bugs and other critters frozen inside, made tissue paper prints by spraying the tissue with water and letting it dry on paper. In addition, we have been having fun with Alfred, who is our new outdoor activity leader. We enjoyed our walk to the Sun Salute Bridge, and found a wonderful branch that we have hung from our ceiling. 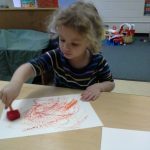 In January , we had fun creating and playing with sensory materials in our classroom; we played with water beads, “slime” (liquid starch and Elmer’s glue), and different colored puffy paint. 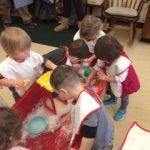 We filled our sensory tables with rice, water and bubbles, and cloud dough (baby oil and flour). We continued to enjoy our “hot chocolate” scented play dough and used it for pretend play dough baking projects. 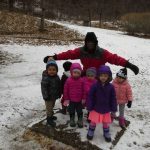 Outside, we enjoyed campus walks, sliding, exploring ice, and spray painting snow (liquid water color in spray bottles). 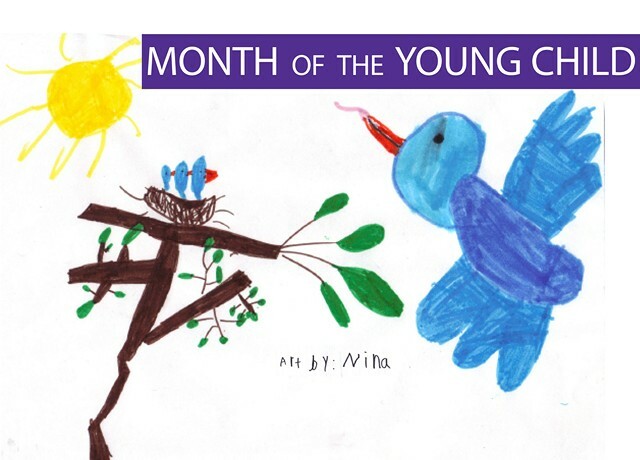 In February we look forward to exploring the themes of love, family, friendship, and kindness! The Oak Room has started off our new year with a bang! We have recently welcomed our new friend Zoey to our classroom. We have been enjoying learning about the features of the Calendar each morning at circle. 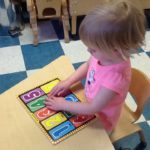 This activity has helped us learn numeral recognition, counting, letter-sound correspondence, days of the week, and beginning concepts of time (yesterday, today, tomorrow). We have started to create snowy owls in our art area and look forward to exploring more of winter’s gifts in our science, sensory, and art areas. We will soon turn our dramatic play center into a grocery store. On our walks in the woods we have begun to notice a variety of animal tracks in the snow. We will start to explore books about winter and animal tracks and will hopefully begin to identify some creatures that call the woods home. We have also enjoyed playing at the cabins in the woods. We have found a perfect patch of ice on a slight hill that we slide down with delight many days. 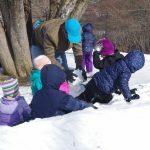 Thursday, February 21 – ELC Sledding Party – families invited to join the fun from 4:30 – 6:00pm on the hill behind Vermont Hall. Classrooms will be making snacks & hot cocoa. Bring your own sled! 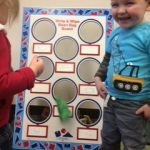 2/6 – Oliver Q is 5! 2/7 – Atticus is 2! 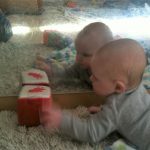 2/11 – Ryan is 1! 2/11 – Happy Birthday, Kerri! 2/15 – Millie is 1! 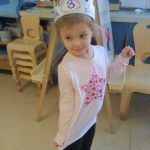 2/16 – Nevaeh is 3! 2/17 – Happy Birthday, Lisa W! 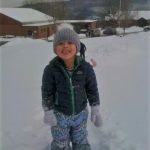 2/22 – Boden is 5! 2/22 – Happy birthday, Joanne! 2/24 – Happy birthday, Paula! 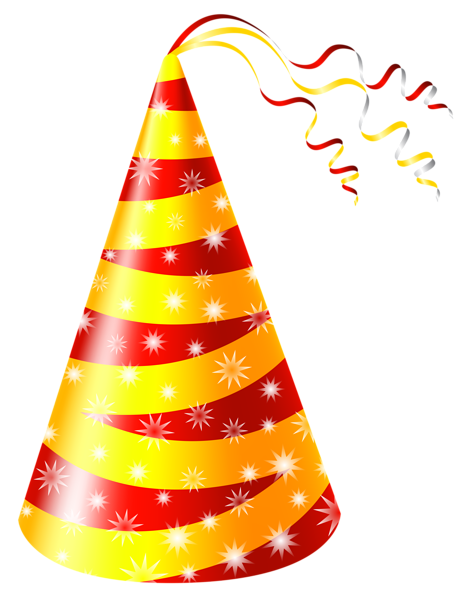 2/25 – Autumnrose is 4! 2/27 – Liam is 5! Our 5th annual Par for the Cause mini-golf fundraiser will be March 9 & 10, 2019. 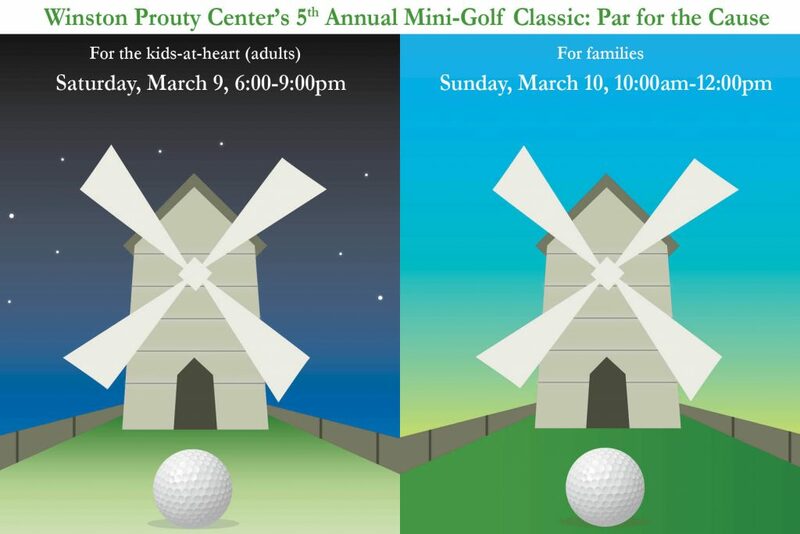 On Sunday, March 10, the indoor mini-golf course will be open for families to enjoy. Mark your calendars – more details to come!